Reading and share top 15 famous quotes and sayings about Fantasy Stories by famous authors and people. 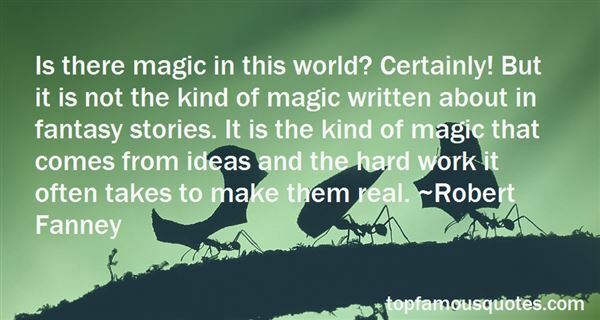 Browse top 15 famous quotes and sayings about Fantasy Stories by most favorite authors. 1. "[...]i'm not a leftist trying to smuggle in my evil message by the nefarious means of fantasy novels. I'm a science fiction and fantasy geek. I love this stuff. And when I write my novels, I'm not writing them to make political points. I'm writing them because I passionately love monsters and the weird and horror stories and strange situations and surrealism, and what I want to do is communicate that. But, because I come at this with a political perspective, the world that I'm creating is embedded with many of the concerns that I have [...] I'm trying to say I've invented this world that I think is really cool and I have these really big stories to tell in it and one of the ways that I find to make that interesting is to think about it politically. If you want to do that too, that's fantastic. But if not, isn't this a cool monster?" 2. 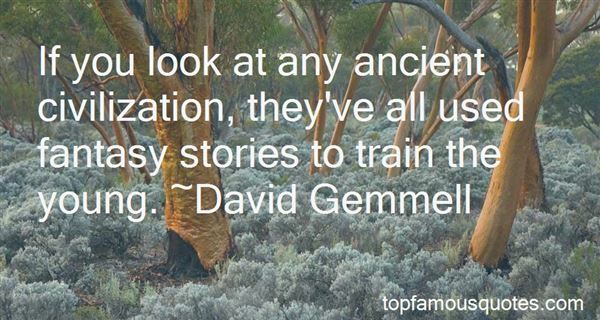 "If you look at any ancient civilization, they've all used fantasy stories to train the young." 3. "We who work in fantasy today take the threads from all the story tellers of the past. From the ancient, many colored threads we work to weave a new cloth. If the landscape, the characters, and the creatures here call up the old tales told the beside the fire, when stories went from mouth to ear instead of page to eye then I have woven well and the dreamer continues to dream." 4. "Fantasy stories will always be popular, as there are always readers who are willing to escape, freely, to the worlds that the authors create, and spend time with the characters we give life to." 5. "It wasn't that we didn't know history. Even if you only count the real world, we knew more history than most people. We'd been taught about cavemen and Normans and Tudors. We knew about Greeks and Romans. We knew masses of personal stories about World War II. We even knew quite a lot of family history. It just didn't connect to the landscape. And it was the landscape that formed us, that made us who we were as we grew in it, that affected everything. We thought we were living in a fantasy landscape when actually we were living in a science fictional one. In ignorance, we played our way through what the elves and giants had left us, taking the fairies' possession for ownership. I named the dramroads after places in The Lord of the Rings when I should have recognized that they were from The Chrysalids." 6. "How do you get the happy ending? John Irving ought to know. One of my favorite authors, Irving writes these multigenerational epics of fiction that somehow work out in the end. How does he do it? He says, 'I always begin with the last sentence ; then I work my way backwards, through the plot, to where the story should begin.' Thst sounds like a lot of work, especially compared to the fantasy that great writers sit down and just go where the story takes them. Irving lets us know that good stories and happy endings are more intentional than that. Most 20 something's can't write the last sentence of their lives. But when pressed, they usually can identify things they want in their 30s or 40s or 60s -or things they don't want- and work backward from there. This is how you have your own multigenerational epic with a happy ending. This is how you live your life in real time." 7. "At this point, a few words on this term 'horror' are perhaps called for. Some amateurs of this kind of literature engage in endless hairsplitting disputes, centered around this word and its close companion 'terror', as to which' stories may so be categorized and which may not, and whether or not descriptions such as weird or fantasy or macabre are preferable. The designation 'horror', with its connotations of revulsion, satisfies me no more than it does the purists but I believe that it is the only term which embraces all the stories in this collection and which succinctly suggests to the majority of readers what is in store for them. Horror then, in this instance, covers tales of the Supernatural and of physical terror, of ghosts and necromancy and of inhuman violence and all the dark corners and crevices of human belief and behavior that lie in between. ("An Age In Horror" - introduction)"
8. "I have such a rich fantasy life, I can't help it. I do make up a lot of romantic stories in my head." 9. "'Castle' is a guy living in a fantasy world. He's in his imagination, writing these stories of murder." 10. "...You believe that the kind of story you want to tell might be best received by the science fiction and fantasy audience. I hope you're right, because in many ways this is the best audience in the world to write for. They're open-minded and intelligent. They want to think as well as feel, understand as well as dream. Above all, they want to be led into places that no one has ever visited before. It's a privilege to tell stories to these readers, and an honour when they applaud the tale you tell." 11. "Lyra learns to her great cost that fantasy isn't enough. She has been lying all her life, telling stories to people, making up fantasies, and suddenly she comes to a point where that's not enough. All she can do is tell the truth. She tells the truth about her childhood, about the experiences she had in Oxford, and that is what saves her. True experience, not fantasy - reality, not lies - is what saves us in the end." 12. "My eighth grade teacher, Mrs. Pabst, had done her master's thesis on Tolkien. She showed me how the trilogy was patterned after Norse mythology. She was also the first person to encourage me to submit stories for publication. The idea of writing a fantasy based on myths never left me, and many years later, this would lead me to write Percy Jackson." 13. "Is there magic in this world? Certainly! But it is not the kind of magic written about in fantasy stories. It is the kind of magic that comes from ideas and the hard work it often takes to make them real." 14. "I'm also old... and my own gift for writing fantasy grows out of very literal-minded, pragmatic soil: the things I do when I'm not telling stories have always been pretty three-dimensional. I used to say that the only strong attraction reality ever had for me was horses and horseback riding, but I've also been cooking and going for long walks since I was a kid (yes, the two are related), and I'm getting even more three dimensionally biased as I get older — gardening, bell ringing... piano playing... And the stories I seem to need to write seem to need that kind of nourishment from me — how you feed your story telling varies from writer to writer. My story-telling faculty needs real-world fresh air and experiences that create calluses (and sometimes bruises)." 15. 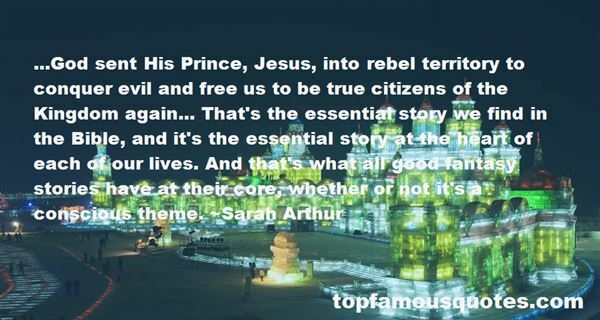 "...God sent His Prince, Jesus, into rebel territory to conquer evil and free us to be true citizens of the Kingdom again... That's the essential story we find in the Bible, and it's the essential story at the heart of each of our lives. And that's what all good fantasy stories have at their core, whether or not it's a conscious theme." Trauma can have a masking effect."